For a fabulously entertaining and totally awesome fun time for children and adults, Black Sparrow Pirate Adventures will take you on an adventure like no other. 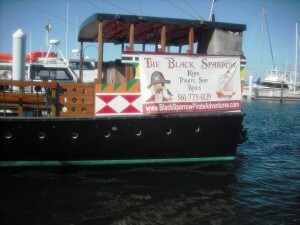 Sailing daily from the Riviera Beach Municipal Marina, Black Sparrow Pirate Ship takes you out around Peanut Island on a 65 minute adventure tour. Participation from the children getting them involved using their imagination into finding the treasure, battling pirates, firing water cannons and listening to pirate stories makes it very entertaining for the whole family. Children should arrive early as each one is geared up for the occasion with pirate attire, props and face painting. It’s all in good fun, something that will be memorable for a long time. 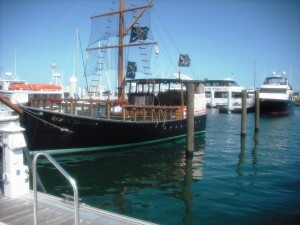 The pirate ship stays in the Intracoastal so it’s very unlikely anyone would get seasick. However, during inclement weather, they may cancel so call and check first. Sailing time daily however please call ahead to confirm.